"Thank you so much for all that you did to help make our anniversary party such a memorable event... The whole experience felt much more as though friends were sharing their wonderful barn and grounds with us. Thank you!" 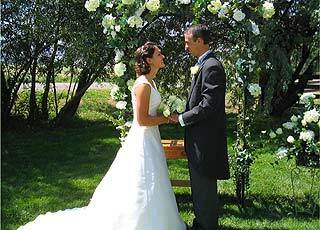 Brides and Grooms from all over the world have chosen the Lazy B Farm in Bozeman, MT, and its country hospitality for their wedding or reception site. Although you may want a rustic Montana experience, you probably don’t want to compromise elegance or convenience. At the Lazy B Farm, you won’t have to. Whether you plan your wedding outdoors, or inside the historic barn, the ranch style atmosphere will give you guests something to remember. You may choose to plan a themed wedding such as a western style event, a garden motif, a medieval event, or simply a traditional wedding. The Lazy B offers options for large gatherings or smaller intimate occasions that will keep your friends and family talking for years to come. Radiant gardens of pink, red, orange and yellow glow from every part of the farm. With flower beds surrounding it on all sides, you may find you don’t even need to bring in your own. The local garden club has enjoyed the impressive grounds for years, and you’ll find the flowers add a soft, charming ingredient to your event. Brides, caterers, wedding planners, and architects were all consulted before the renovation began on the historic barn, to make sure it would work well for any kind of event. Now you’ll find two heated restrooms that are handicapped accessible, a kitchen area that includes a sink, a large counter top for clean up, and refrigerator to store your leftovers. The stable area that was once home to the horses that did the work on the farm are now a serving area for drinks, deserts, or the main meal for your guests. This bar was designed out of the floor boards from the barn, and refinished to maintain the historic elements that make up the Lazy B Barn. The Lazy B will help ease the load of planning your wedding and simplify the process by providing many on site options, and several different packages that cater to your wedding or reception needs. By combining the rehearsal, wedding, and reception in one Location, the Lazy B can save you hours of planning time, and unnecessary expense. This can simplify things for you and your guests, and leave more time to enjoy each other. With every reservation, we provide a list of excellent local vendors who can help assist with your event, saving many hours of your time. There are several lodging options for your guests just minutes from the Lazy B. The Gateway Inn is just up the road, and offers 33 rooms. There are several bed and breakfasts nearby, and Bozeman is only a five minute drive away with all of its lodging options.